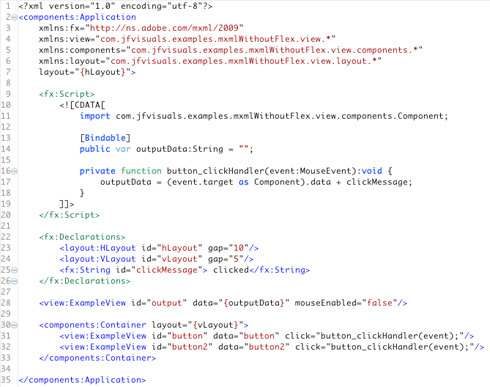 Yesterday while working in Paris a co-worker seamed to be a bit surprised that it's possible to use MXML whithout extensive dependencies on the Adobe Flex Framework. So I made a tiny example app. Of course it's smaller than 20kb. Surprisingly most people are more interested in using the component framework without MXML than the oposite. Maybe they haven't mentioned the advantages of declarative language features in the right development environment for tasks like composition, skinning and configuration. Don't get me wrong - most of the things I'm developing are programmed in Actionscript! In this case the [DefaultProperty] and [ArrayElementType] Metatags are essential. Just have a look! The next step is to focus a bit more on the Databinding feature. 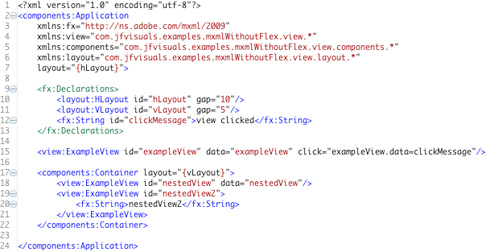 In a real world application no one would use a code block inside of his MXML file by choice. Instead of this e.g. a Presentation Model or Presenter Pattern can be applied. If you use the additional compiler argument -keep you will mention that several classes of the mx.core. * and mx.bindings. * package are imported in the generated code. but hey! do we really care about this hand full of kb?